MICCO – The American Red Cross in Brevard County is installing free smoke alarms in Barefoot Bay homes as a national effort to reduce fire deaths. To date, 235 confirmed lives have been saved (nationally) by a smoke alarm that the Red Cross installed. They generally target higher-risk neighborhoods, most often mobile and manufactured home communities. “A fire chief friend of mine told me that a mobile home can burn to the ground in as little as 4 minutes, leaving people precious little time to escape. Sometimes as little as 90 seconds. It is especially critical for elderly or disabled residents who may have trouble escaping a burning home. 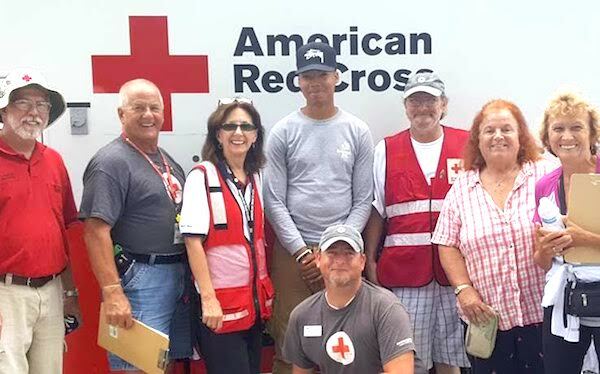 An early alert can make all the difference,” Mike McElrath, Disaster Program Manager for the American Red Cross in Brevard County, told Sebastian Daily. McElrath says they also have the ability to install hearing-impaired alarms for deaf/hard-of-hearing residents. In addition to installing free smoke alarms, the Red Cross also educates residents on fire safety and help them create an escape plan. They talk with residents about tips to prevent fires in the home. “Since we have the second largest mobile home community in the United States, Barefoot Bay, it presents a tremendous challenge and opportunity to build our resilience and preparedness for home fires,” said McElrath. McElrath has been collaborating over the last few months with rolling the Home Fire Campaign into Barefoot Bay. With a brand new HOA coming on board, it has taken a while to get things on the ground, but now they have the ball rolling. “We have created an online registration portal, and residents simply go online and register for their free smoke alarms. We come down and install on the first Saturday of each month,” McElrath said. Several residents of Barefoot Bay have signed up to volunteer as well. In addition, once they work out the bugs and get into a rhythm, the Red Cross hopes to have the local fire station and volunteer firefighters involved with them. “As word-of-mouth spreads, and neighbors tell neighbors, I anticipate the events to grow. Since half of the park is seasonal, I also anticipate a surge of registrations in the fall also,” McElrath stated. McElrath says the first event was Saturday June 3 when they installed 105 smoke alarms in 46 homes, many of which had old and non-working smoke alarms. It’s truly a great start to a huge project. “The residents, HOA, and Neighborhood Watch of Barefoot Bay have been a huge help getting this started, so kudos to them as well,” McElrath added. To register your home, visit the online registration portal at clicking here.